Margaret Therese Moriarty (ca. 1864-1950) = my great-great-grandmother. 1883 (January 25): Marries Nicholas C. Saint Bonnet (1856-1936). Spelling variations in documents include Barnett, St. Bonnett, St. Bonnet. Family background. Parents born in Ireland, moved to the USA. 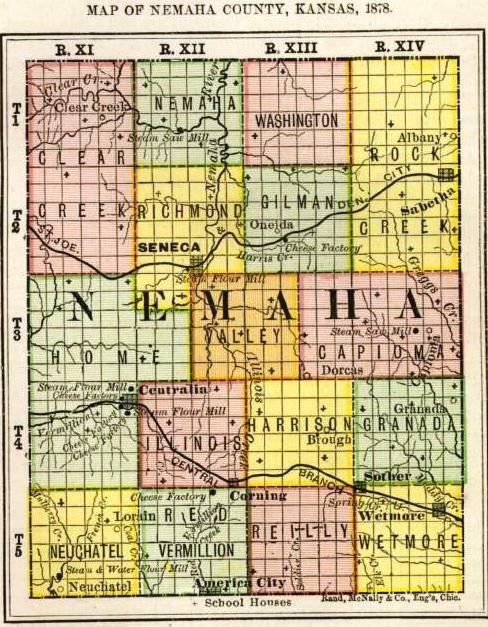 Settled in Kansas around the time of the American Civil War. One obituary says parents named Thomas Moriarty (or Moriarity) and Mary Whalen. 1870 Census. Clear Creek Township, Seneca Post office, Nemaha County, Kansas. John Moriarty (sometimes misspelled Morierty) 55. Farmer. Born in Ireland. Male citizen of US. Real estate $2,500. Personal estate $600. Catherine Moriarty 42. Born in Ireland. Housekeeper. Elizabeth Moriarty 15. Born Wisconsin. Parents of foreign birth. At home. John Moriarty 11. Born Wisconsin. Parents of foreign birth. At home. Thomas Moriarty 9. Born Kansas. Parents of foreign birth. Attended school within last year. Margaret Moriarty 6. Born Kansas. Parents of foreign birth. Attended school within last year. Mary Ann Moriarty 4. Born Kansas. Parents of foreign birth. Attended school within last year. Catherine Moriarty 2. Born Kansas. Parents of foreign birth. Charles O’Neill 19. Farm laborer. Born in Ireland. Parents of foreign birth. Michael Hughes 26. Farmer. Born in Ireland. Male citizen of US. Real estate $1200. Personal estate $450. Can’t read, can’t write. 1880 Census. Marion, Nemaha County, Kansas. Note: Where’s Margaret Therese Moriarty? John Moriarty has died. Catherine Moriarty 52. Born in Ireland. Keeping house. Widowed. Cannot write. Micheal [Michael] Moriarty. 32. Son. Born in Ireland. Farmer. Single. Cannot write. Elisabeth Moriarty 24. Daughter. Born in Connecticut. Parents of foreign birth. Keeping house. Single. Mary Ann Moriarty 16. Daughter. Born in Kansas. School teacher. Parents of foreign birth. Attended school within last year. Single. Catherine Moriarty 12. Daughter. Born in Kansas. Keeping house. Parents of foreign birth. Attended school within last year. Single. Albert Berry[?] 10. Bound. Born in Illinois. Apprentice[?]. Parents born in Illinois. 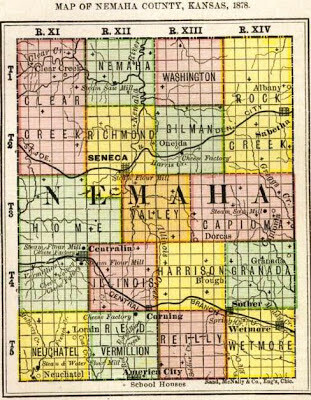 I have a preliminary finding via the 1875 Kansas Census, Nemaha County, Clear Creek Township, under "Marriaty" family. Score! Moriarty can now be traced back to Tipperary - yeah !